School of Wok in Covent Garden has been doing some fine work in recent years. 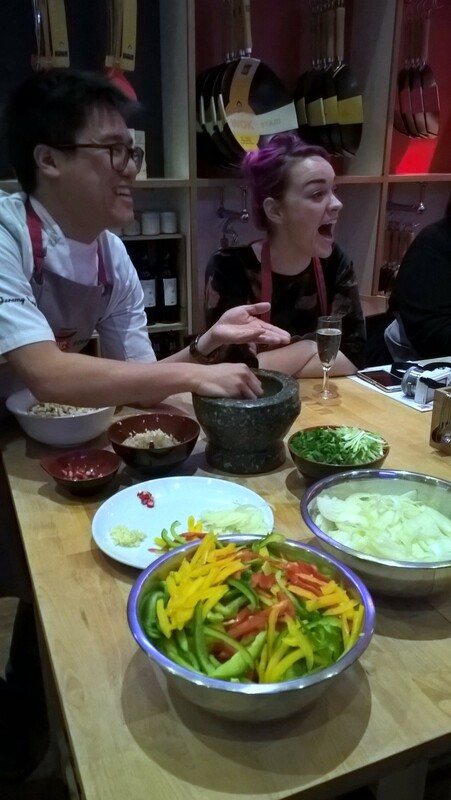 Founded by Jeremy Pang who comes from a long line of Chinese restaurateurs, School of Wok has been running for about 4 years and is one of the few Chinese Cookery Schools in the UK. Before opening School of Wok, Jeremy was already teaching students Chinese cookery at homes, trying to share with them the true essence of Chinese cooking. His enthusiasm of the subject matter is striking and is a testament to why School of Wok has seen such success. 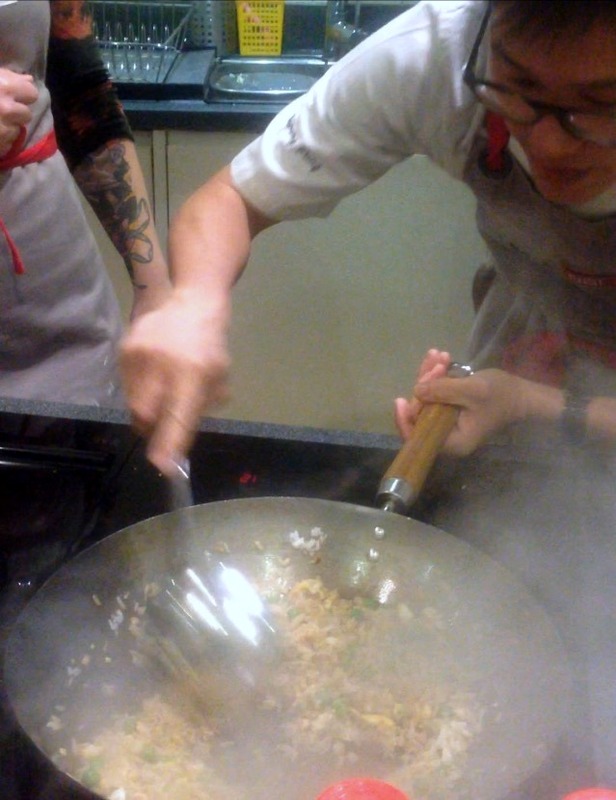 Last week I attended an event at the School of Wok to learn some wok skills from Jeremy. The class was called “Understanding the Wok” and was to showcase the new Dexam School of Wok wok range, made by Dexam in consultation with Jeremy. The woks are made with carbon steel to heat up quickly and bamboo handles for easy handling. What’s more, the woks are light, to enable the cook to lift the wok and easily toss the food! The ever engaging Jeremy took us through both knife skills, and of course cooking using a wok. 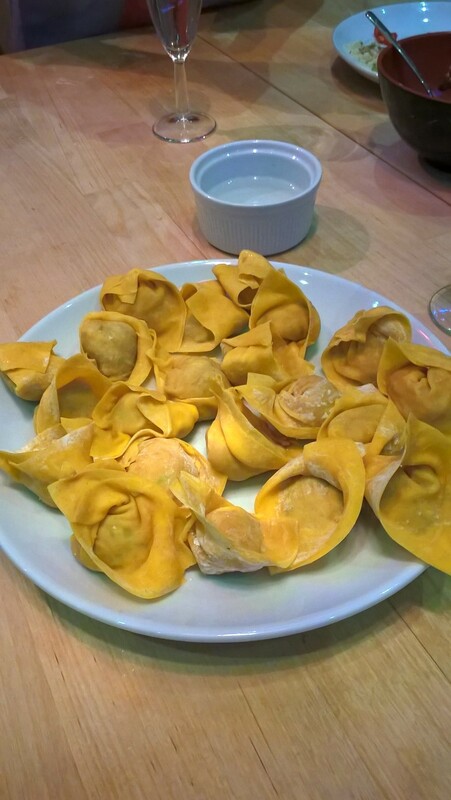 On the day we covered three recipes: wontons, egg fried rice and stir fried Sichuan chicken, and in covering each dish, Jeremy broke them down into very easy to understand concepts. I grew up eating Chinese food, and so I of course love wok cooked food. What makes Chinese wok cooking special is the concept of 鑊氣 “wok hei”. We didn’t touch on this concept during the class, but it’s a concept I’d like to share with the reader as it is a very important aspect of wok cooking. The words “wok hei” loosely translates as “wok breath”, but the idea behind “wok hei” is much more complex than that. It relates primarily to the fact that at the right high heat – and this is the key, high heat – the wok, helped in part by the fact that it is curved, will spread the right level of even heat to cook the food, thereby imparting a highly unique concentrated flavour and aroma to the food. In Western terms, this can be compared to the concept of “caramelisation” of eg, meat. Therefore both a good wok and a really hot hob are both essential aspects of good wok cooking. 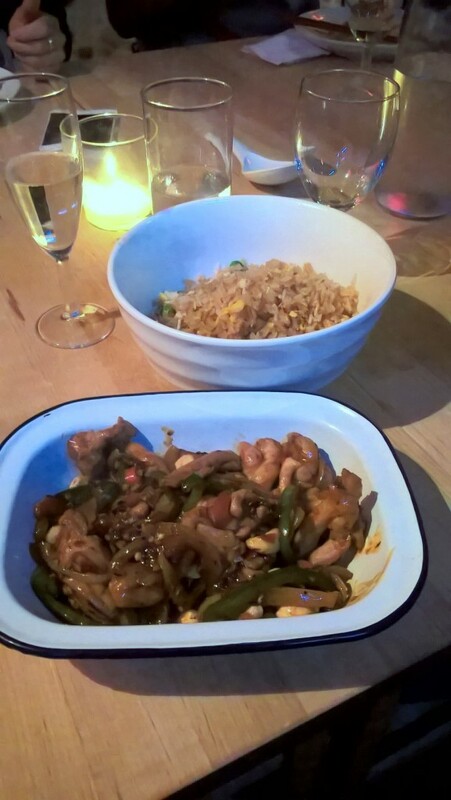 I really enjoyed have a bit of a toss and a stir with the Dexam School of Wok wok, cooking both the fried rice and the stir-fried chicken (the wontons were deep-fried). It felt light and durable, and with the School of Wok’s state of art induction hobs which have been especially designed for woks, the results were great. But most importantly, the class was fun. And the best bit of the class – well that was definitely the eating! Thank you for explaining in detail about the wok. Have used it so many times, but now I know why it is so important for cooking Chinese food! Nice post and thanks for share with us. Feestzaal, Thanks for your comment. I am glad I could share!